The following textual materials are samples from the Mary Anne McEwen Fond. Her collection includeswritings by McEwen about her video projects, Celebration ’90 and Gayblevison, scripts, camera logs, correspondence, budgets, artist releases, publications, documents, and ephemera. More materials will be added as they are digitized. Celebration ’90 publications are posted here with the permission of Richard Dopson, representing the now disbanded Metropolitan Vancouver Arts & Athletics Society. 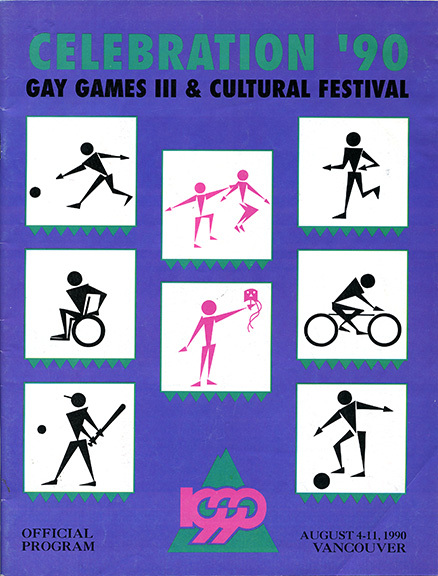 A brochure soliciting annual memberships in support of the Gay Games III. Publication date unknown. Outlines the project, anticipated audience, revenue streams, and dissemination strategies. It includes bios of the principals and budget.